Law students have a number of scholarship opportunities available to help finance their law education. 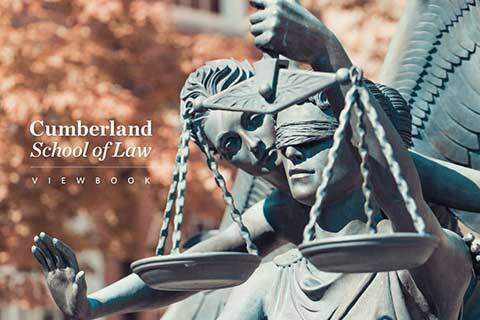 Every student admitted to Cumberland School of Law is considered a possible scholarship student. Those found most deserving by the dean and the scholarship committee will be offered financial assistance in the form of full or partial tuition scholarships. Q: What kinds of scholarships are available for entering law students? A: Merit scholarships are awarded to entering students on the basis of LSAT scores and undergraduate GPA. Award amounts vary and range from a few thousand dollars to full tuition. Q: How do entering law students apply for scholarships? Second-year (2L) and third-year (3L) students may be eligible to receive endowed, need-based, merit, or leadership scholarships, made possible through the generosity of the law school’s alumni and friends. Q: How do 2L or 3L students apply for available scholarships? A: Endowed, merit, and leadership scholarships are automatically awarded to 2L and 3L students who meet the qualifications for those scholarships. There is an application for the need-based scholarships. The application is available in the spring semester each year. Q: What kinds of scholarships are available for current law students? Need-based scholarships—awarded based on financial need; annually updated FAFSA and completed application are required for consideration. The application process will be communicated via electronic mail by the Office of Law Admission. Academic scholarships are awarded by the dean and the scholarship committee on the basis of criteria established by the donor. Presidential, university and dean’s scholarships are awarded to outstanding entering first-year students. Recipients are selected by the dean. Established by colleagues, former students and friends to honor the memory of this retired faculty member, the scholarship is awarded on the basis of academic achievement and need. Established by Arthur Baron of Orlando, Florida, class of 1976, in honor of the late Donald E. Corley; awarded on the basis of scholastic merit and need. Established by BellSouth to be awarded on the basis of academic merit. Established by Joseph M. (Buddy) Brown, Jr., of Mobile, class of 1977, in memory of his parents. It is awarded on the basis of scholastic merit. Established by James M. Burton, class of 1974, through provisions in his will. The fund provides scholarships for students who have outstanding academic achievement and demonstrated financial need. Established by Jere F. White Jr., a Cumberland School of Law 1980 graduate, this fellowship seeks to identify outstanding students with strong credentials, a history of leadership and commitment to service that has been demonstrated during and/or after graduation from college. Preference is given to applicants who have served in the military, Peace Corps, Teach for America or other programs benefiting under-served communities. Established by friends of Judge Coleman, a longtime Alabama bankruptcy judge. The scholarship is awarded to a student interested in bankruptcy law. Established by the Drivers under a trust in their wills, the scholarship benefits second- or third-year students from smaller communities who have a record of outstanding academic achievement. Established by former law clerks and friends of Judge Joel F. Dubina ’73, in his honor, this endowed scholarship will be awarded to a law student based on the merits of scholarship, character, and worthiness or need. Established by Mr. and Mrs. Echols through their wills, the scholarship assists second- or third-year students who have a record of outstanding academic achievement. Established by former law clerks and friends of Judge Godbold, chief judge of the fifth and eleventh United States Circuit Courts of Appeal (retired). The scholarship is awarded on the basis of academic achievement and is renewable. Initiated by professor Sara Clark and supported by the widow and son of the late professor; awarded on the basis of academic achievement and demonstrated financial need. Established by Walter C. Jones IV, class of 1981, in honor of his grandfather. Established in memory of the late Cumberland professor, the scholarship is awarded on the basis of academic achievement, financial need and involvement in the law school and community. Established through the will of Mary Martin Brown in memory of her father, who joined the Cumberland Law School faculty in 1878. He was appointed dean upon the death of Judge Nathan Green in 1919 and served until his own death in 1920. The proceeds of this endowed scholarship will assist a deserving third-year student recommended to the dean by the scholarship committee. Established by the Martin Foundation in memory of Thomas Wesley Martin, a lawyer and founder of Alabama Power Company. Established by Wayne Morse, class of 1976, in honor of his father, Lt. Wayne Morse USMC. The endowed scholarship is awarded to a rising third-year student with the highest GPA, who has honorably served or is serving in a branch of the military. Established by the late Margaret Waddell Peters, class of 1931, in honor of her late husband, also a member of the class of 1931. Endowed by H.P. Johnston to assist law and pharmacy students. Established through the will of Edwin Rollison, widow of former Professor Rollison, to assist third-year students with outstanding academic achievement and demonstrated financial need. Established by the law firm to assist an outstanding second- or third-year student who ranks in the top 15 percent of his or her class and has no other significant scholarship assistance. Established by a bequest of Lillian Ward Shepherd; awarded on the basis of academic achievement. Established by the law firm of Spain & Gillon to assist a rising senior who does not have other significant assistance. The recipient is recognized each year as the Grooms Senior Scholar. Established by the firm of Spain & Gillon in memory of M. Alan Stephens, class of 1984, this scholarship is awarded to an outstanding third-year student concentrating in the area of business, tax and corporate law. Established to honor the former dean of the law school, the scholarship is awarded on the basis of academic achievement and need. Established by former dean Parham H. Williams in honor of his mother, Mary H. Williams, class of 1925, the scholarship is awarded to a senior law student who has shown the greatest promise in legal writing based on contributions to the Cumberland Law Review (even-numbered years) or the American Journal of Trial Advocacy (odd-numbered years). Selection made by the board and faculty adviser of the respective publication. Established by friends and colleagues of Parham H. Williams upon his retirement as dean of the Cumberland School of Law (1985–1996). Mark Ezell, an attorney from Butler, Alabama, and T. Roe Frazer, class of 1985, provided the initial corpus for the fund, which recognizes outstanding academic achievement by a student, regardless of class year. Recipients are chosen by the scholarship committee from a pool of nominees following interviews and other selection criteria. The grant is awarded beyond tuition. Established by the academy, this annually-funded $1,000 scholarship assists two students who excel in domestic law. Established and annually funded by the Alabama chapter of the American Board of Trial Advocates, this scholarship is awarded to the student actively involved in the Trial Advocacy Program who demonstrates superior qualities of leadership and achievement. Established by Jere Beasley and the law firm of Beasley Allen Crow Methvin Portis & Miles PC to recognize and assist an outstanding second- or third-year law student actively involved in the Trial Advocacy Program who does not have other significant scholarship assistance. Beasley is a Montgomery attorney and is a parent of an alumna of Cumberland School of Law. Cumberland School of Law professor Jill Evans has established the Ross and Verona Evans Environmental Scholarship in Law in honor of her parents. The scholarship will benefit students interested in a career in environmental law. Part of the annual scholarship will assist second- or third-year students enrolled in the juris doctor/master of environmental management joint degree program and part will assist a rising second-year student in attending the summer study-abroad program in environmental law conducted at the University of Victoria in Victoria, British Columbia. Established in 2003, this scholarship recognizes ability and achievement in trial advocacy. The recipient will be a second- or third-year student who is actively involved in the trial program and has shown financial need and demonstrated academic achievement. Established by the law firm of Starnes and Atchison to recognize achievement in the area of trial advocacy, the scholarship is awarded to the winner(s) of the Parham H. Williams Freshman Trial Competition and is applied to tuition for the second year of law school. Lanny Vines, a Birmingham attorney and parent of a Cumberland School of Law alumna, awards a scholarship to directors of the trial board in honor of Professor Herbert W. Peterson, retired co-director of the trial program. The Lauderdale Law Week Scholarship was established by friends in honor of the late Col. Douglas C. Lauderdale, class of 1932, and an avid supporter of Law Week. This partial tuition scholarship is provided to the Law Week chairman. Herman J. Russomanno, class of 1975 and former Student Bar Association president, has established this partial scholarship to be awarded each year to the president of the Student Bar Association. Each year, graduating students at Cumberland School of Law have the opportunity to apply for two full-tuition scholarships and additional half-tuition scholarships to earn LL.M. degrees (master of laws in international study) for study at The Norwich Law School, the University of East Anglia, England. Any student graduating is eligible to apply. The application process is held during the fall semester of the third year of study at Cumberland School of Law. The recipients are notified before graduation. The scholarships are awarded under a cooperative arrangement between Cumberland School of Law and The Norwich Law School. In return to the scholarships given to Cumberland School of Law, British law students study at Cumberland School of Law. Endowed scholarships are provided to attract outstanding scholars to the Cumberland School of Law and to honor distinguished professionals who have made significant contributions to society through lives of dedicated service. Established by Balch & Bingham LLP. Established by the family and friends of the late Judge Beasley. Funded by contributions from the Birmingham firms of Berkowitz Lefkovits Isom & Kushner and Leitman Siegal Payne & Campbell PA. Funded by the Birmingham law firm of Bradley Arant Rose & White. Established in memory of the former dean of Cumberland School of Law. Established by family, friends and colleagues to honor the memory of Dale Corley. Made possible by the contributions and efforts of the Davis family. Established by Edna Duke of Winter Park, Florida, in memory of her father, a member of the class of 1900. Funding for this recruiting scholarship is provided through a charitable remainder unitrust established by Duke. The original gift was property donated to the law school. Made possible by contributions and efforts of the Birmingham law firm of Hare Wynn Newell & Newton. Established by Charles Mauney, class of 1976, in memory of the late Judge Haralson, class of 1926. Established to help attract outstanding freshman law students. Funded by the law firm of Rives & Peterson. Made possible by the contributions and efforts of the Starnes family and the Birmingham law firm of Starnes & Atchison. Established by his son, James C. Turk Jr., class of 1984. Established by Frank M. Young III of Birmingham, class of 1969, in honor of his father. Need-based scholarships have been established to assist worthy second- and third-year students who have significant financial need as determined from the FAFSA or similar need analysis. Applications are requested through the Office of Operations. Established in memory of Charles H. Alexander. Established in 1980 by family and friends in memory of Franklin Whyte Bedford, class of 1979. Mark and Alison Calhoun and their daughters have established a scholarship in honor of Alison Calhoun’s father, the former governor of Alabama, Albert P. Brewer. Second- or third-year students with demonstrated financial need and academic achievement are eligible for consideration. Preference is given to residents of the state of Alabama who are near the top of their class and have no other scholarship assistance. Established by former governor Albert P. Brewer and Martha F. Brewer, this endowed scholarship will assist a second- or third-year student with demonstrated financial need. Established in 2003, this scholarship assists second- or third-year law students who have demonstrated financial need and academic achievement. Established in 2004 to honor Birmingham civil rights pioneer A.G. Gaston, this scholarship assists second- or third-year minority law students who have demonstrated financial need and academic achievement. The estate of Nina Hodge Cline has established the Johnnie Noble Hodges Scholarship in honor of Johnnie Noble Hodges. The scholarship will be awarded to a second- or third-year student with one or more children who demonstrates financial need. Established by Judge John A. and Mildred Jamison through a provision in their wills. Judge Jamison graduated from the Cumberland School of Law in 1941. The scholarship will assist a second- or third-year student with demonstrated financial need. This scholarship will be awarded to a second- or third-year student demonstrating outstanding academic achievement and financial need. Established by the law firm of Marsh Rickard & Bryan, this scholarship assists second- or third-year students with demonstrated financial need. Preference is given to Alabama residents who are at the top of their class and do not have other scholarship assistance. Established by Ara Mullins, a 1927 graduate of Samford University, in memory of her brother, U.S. District Judge Clarence Mullins, who practiced law for 25 years prior to serving on the bench. Established by the law firm of Porterfield Harper & Mills, this annually-funded scholarship assists a rising second-year student with demonstrated financial need. Established by his wife, Eleanor Robinson, and the firm of Lange Simpson Robinson & Somerville. Established by Romaine Scott in memory of Carol Lindsay Scott, the scholarship is awarded annually to assist with the purchase of books. Recipients must be members of the Christian Legal Society. Established in 2004, this endowed, need-based scholarship is awarded to second- or third-year students with demonstrated financial need. Preference will be given to students from Georgia who are in the top half of their class and have no other scholarship assistance. Established by Mr. and Mrs. Robert F. Splitt in loving memory of their son, Warren. Splitt graduated from Cumberland School of Law in 1976. The recipients must be from Florida and intend to practice in Florida. Established by the Student Bar Association to assist a needy second- or third-year law student. David L. and Grace S. Thomas have established a scholarship in memory of their parents, E.W. and Blanche Thomas, and Grace D. and Roy W. Knight Jr. This fully-endowed scholarship is intended for second- or third-year students with demonstrated financial need and academic achievement. Recipients must be residents of the state of Alabama. Preference is given in the following order to: (1) graduates of Jacksonville State University in Jacksonville, Alabama, (2) residents of Hoover, Alabama or Homewood, Alabama, or (3) residents of Jefferson County, Alabama. This scholarship assists second- or third-year minority or female students who have demonstrated academic excellence, service to the legal profession, service to the community and service to the cause of diversity. More information and the scholarship application can be found here. The Cumberland Chapter of the Black Law Students Association (BLSA) has established the W. J. Ellison/BLSA Scholarship in honor of professor W. J. Ellison, a longtime member of the Cumberland School of Law faculty. The endowment will provide scholarship assistance on an annual basis for the second- or third-year BLSA member who has made the greatest contribution to the life of the law school. Established in 2003, this scholarship assists second- or third-year minority law students who have demonstrated financial need and academic achievement. Established to encourage students who are members of racial, ethnic or socioeconomic groups underrepresented in the legal profession. The scholarship is awarded to a second- or third-year student on the basis of criteria established by Samford University and SONAT. Established by the family of a native Tennessean who characterized the tradition and heritage of Cumberland School of Law rooted in Lebanon, Tennessee. It is awarded to a Tennessee student who exhibits the qualities of a superior trial advocate. Judge Cabler Corbitt, a 1933 graduate of Cumberland School of Law, established a trust fund to provide scholarships for Tennessee residents who agree, in writing, to practice in the state of Tennessee for a period of not less than five years after graduation and admission to the Tennessee Bar. An annual scholarship in the amount of $1,000 is awarded to a third-year student, preferably an Alabama resident, who has achieved an interest and ability in trial and appellate practice. An annual scholarship in the amount of $500 is awarded to a deserving second-year law student who is an Alabama resident and shows promise as a trial lawyer. An annual scholarship of $1,000 is awarded by the Birmingham Bar Scholarship Committee to a deserving law student, a resident of Jefferson County, Alabama, who intends to practice law in the Birmingham area. Applications should be filed with the Birmingham Bar Association Memorial Fund Scholarship Committee, 900 Jefferson County Courthouse, Birmingham, AL 35203. The Birmingham law firm of Cabaniss Johnston Gardner Dumas & O’Neal established a scholarship through the Alabama Law Foundation Inc. in 1987 to commemorate the entrance of the law firm into its second century. The scholarship is awarded to a top second-year student from Alabama who is enrolled in an accredited law school. For information and application, contact the Alabama Law Foundation, Inc. 415 Dexter Avenue, Montgomery, AL 36104. Goodman Acker PC is pleased to announce its first annual 2015 Law School Scholarship for law students. The scholarship has been created as part of Goodman Acker’s commitment to give back to the community by rewarding law students who demonstrate high academic achievement, strong communication skills and an interest in practicing law. The 2015 Goodman Acker Law School Scholarship is $1,000.00 and will be awarded to a student who has achieved high academic achievement, submitted an original essay, and is currently attending or has been accepted to an accredited law school in the United States. This includes students enrolled at an accredited 4-year university that have been accepted to a law school. (Copy of acceptance letter will have to be included in application submission). All information can be found by visiting https://www.goodmanacker.com/about-us/giving-back/scholarship/. Please refer any questions regarding the scholarship to 248-483-5000 ext. 2231 or temp1@goodmanacker.com. The Indian River County Bar Association has established a scholarship fund to provide annual awards to law students from Indian River County, Florida. For information, deadlines and application contact: Robert C. Nall, McKinnon, Stewart & Nall, P.O. Box 3345, Vero Beach, FL 32964-3345, 305-231-3500. The Justice Janie L. Shores Scholarship is awarded to one or more female Alabama residents attending an Alabama law school. The Woman's Section of the Alabama State Bar established the Justice L. Shores Scholarship, named in honor of the first female Alabama Supreme Court Justice. Scholarships are awarded annually. The application deadline is April 1. The application may be found here. Established by the Magic City Bar Association to assist a rising third-year minority student who has shown outstanding leadership and/or academic achievement. Each year, The Reeves Law Group offers a $5,000 scholarship to a future law student in their senior undergrad year or a student currently in law school who authors a winning essay about their genuine desire and goal of using the legal system to fix problems or improve conditions in our society. The full eligibility details and entry requirements for the scholarship can be found here. The Rotary Foundation offers international study scholarships to students 18 to 28 years old who are proficient in the language of the proposed study country. Application deadline is March 1. Contact any local Rotary Club or The Rotary Foundation, 1600 Ridge Avenue, Evanston, IL 60201, 312-328-0100. One $500 scholarship is awarded per chapter each academic year to a fraternity member who has been a member at least six months and is in good standing with the chapter. Contact the Cumberland School of Law chapter for details. The International Legal fraternity of Phi Delta Phi makes an award of $100 each fall to the Phi Delta Phi member attaining the highest scholastic average in his or her first year. Phi Delta Phi also makes loans of up to $500 available to members of the fraternity. Contact the Cumberland School of Law chapter for application materials. The Alabama Lawyer, a publication of the Alabama Bar Association, has established an annual award of $250 for the best article submitted by a student for publication in The Alabama Lawyer. The subject of the article, which is announced in September, must be an area of current general interest to the practicing bar. The BAR/BRI has established a BAR/BRI Review Course Award, which consists of full tuition for one BAR/BRI Bar Review Course awarded annually to a graduating senior based upon achievement, service and financial need. Each year a cash award is given to the student submitting the best paper on any area of federal or state civil procedure. The competition is sponsored by former Cumberland School of Law professor Frank Donaldson, who served as U.S. Attorney for the Northern District of Alabama. The Mobile law firm of Hand Arendall Bedsole Greaves & Johnston has established an award for students involved in the moot court program at Cumberland School of Law. This is a cash award from the law firm to a student(s) who, in the opinion of the faculty, have shown the most promise in appellate advocacy through brief writing, oral presentation and contribution to the overall advocacy program. Established by the board of directors of the Southeastern Law Placement Consortium in memory and honor of Sylvia Key Hollowell, former director of placement at the Cumberland School of Law. The award is given annually to a deserving student. The Scholar of Merit Award is awarded each semester to the freshman, junior and senior who receives the highest grade in each class. Each spring during Law Week an award is made to a second-year law student in need of financial assistance, who is interested in a career in banking or trust law and who has maintained an above-average academic record. The award is made in memory of George M. Stewart, class of 1947, by his daughter, Peggy Stewart Reeves. Each year, the Mobile Bar Association gives the Judge Daniel H. Thomas Award in Admiralty to the student making the highest grade in admiralty at Cumberland School of Law. Judge Thomas graduated from the University of Alabama Law School in 1928. In March of 1951, President Harry Truman appointed him U.S. District Judge for the Southern District of Alabama. In 1971, he assumed senior status and has presided over various admiralty trials throughout the United States.